Today is a Two of Swords Day – Prepare to see things as they really are. With the sun in Gemini (where we learn that dichotomies like dark/light and good/bad – are but two sides of the same coin) and (2) the moon in Libra (where we often find ourselves in a stalemate) today is a Two of Swords day. 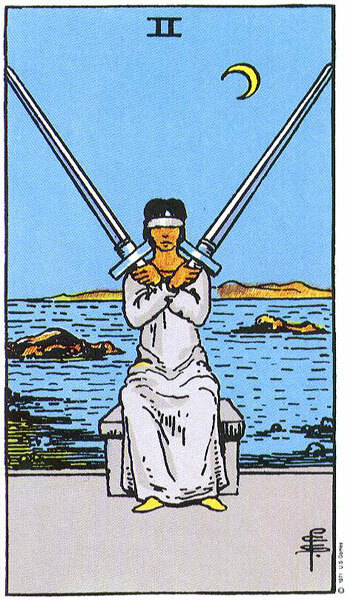 On a divinatory level, the Two of Swords suggests we’re trying to preserve the status quo at all costs. But if only we’d look close enough, we’d see we’re clutching at straws – for the sands beneath our feet are shifting as surely as day slips into night and back again into day. For the Kabbalist, today’s energy is grounded in the second sephira, Chokmah otherwise known as Wisdom. Each phase of evolution commences with an unstable force proceeding through organisation to find equilibrium. Yet once this balance is achieved, no further progress is possible without first overturning the apple cart to make room for change. That for which we strive on a Two of Swords day is no less earth-shattering than the knowledge acquired by Adam and Eve upon taking that fateful bite from the apple. Without knowing dark we how can we know light? Without knowing bad how can we know good? Try describing black without mentioning white. It’s pretty hard, if not impossible, to do. Yet unless you’re to live in the stalemate of the Two of Swords this is precisely what you must do. On a Two of Swords day you have an opportunity to take off your blindfold and read the writing on the wall. Maybe everyone but you knows your job is at risk, your partner is unfaithful, or your best friend is spreading lies. Someplace in your life, something isn’t working and you’ve chosen not to know. Today you can take the first step toward fixing that something so that it does. Previous article Today is a Six of Wands Day – that’s right – lots of hot air!